Background: Surgical team training is emerging as an important component of patient safety. One pattern of teamwork is the Shared Mental Model, where all members are “on the same page,” and have a common set of knowledge, expectations, and skills. The feasibility and value of having assistant surgical technologists share the same basic skill sets as surgeons during laparoscopy and endoscopy has not been investigated. Our objective was to evaluate initial ability with simulated laparoscopic and endoscopic skills and user impressions of skills training with surgical technologists. Methods: A total of 102 surgical technologists at the Association of Surgical Technologists (AST) 2009 annual meeting were recruited to participate in the Fundamentals of Laparoscopic Surgery Peg Transfer Drill, and two virtual reality drills (Endobubble and laparoscopic cholecystectomy clipping) on the GI Mentor and LapMentor (Simbionix, Cleveland, OH). Time and errors were recorded for a single trial and user impressions gathered for the usefulness-to-occupation of the drills, and surgical simulator training in general, on a five point Likert scale (strongly disagree, disagree, neutral, agree, strongly agree). A pre-survey was administered for experience level, nature of occupation, and demographic data from participants. Results: Seventy-six participants performed the PEG Transfer drill for 1 trial with a mean time of 117 +/- 61 seconds, with 5.4% of participants able to complete the drill in a time equal to or faster than published expert proficiencies (48 sec). Experience with laparoscopic cases (>100 cases per year, versus 25-100 cases/yr, < 25 cases per year, or never) was statistically significant for participants who were able to achieve expert time proficiencies with a single trial (p = 0.051). None of the participants (n=25) on the Endobubble virtual reality endoscopy drill were able to reach published expert proficiencies (Texas Association of Surgical Skills Laboratories [TASSL] endoscopy curriculum). There are no established proficiency guidelines for the LapMentor cholecystectomy clipping drill. User impressions of surgical technologists were very high (4.8 +/- 0.58) for the value of surgical simulators to facilitate working better within an operative team. Conclusion: Surgical teams may perform more efficiently and safely with a pattern of teamwork that includes shared knowledge, skills, and expectations. 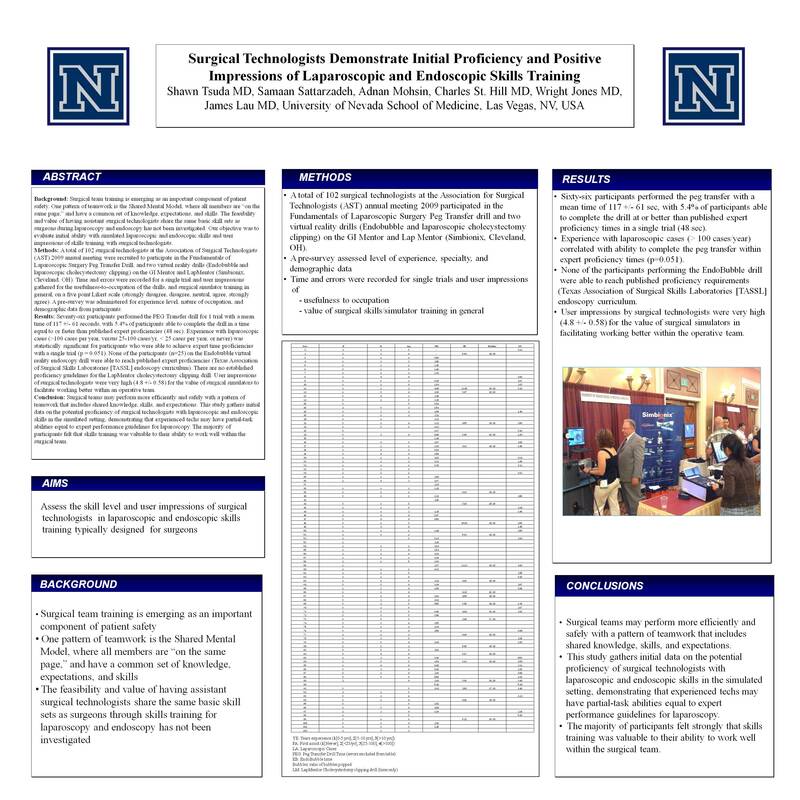 This study gathers initial data on the potential proficiency of surgical technologists with laparoscopic and endoscopic skills in the simulated setting, demonstrating that experienced techs may have partial-task abilities equal to expert performance guidelines for laparoscopy. The majority of participants felt that skills training was valuable to their ability to work well within the surgical team.